With the growth of our global office network, we are now offering 24-hour global support for our clients. 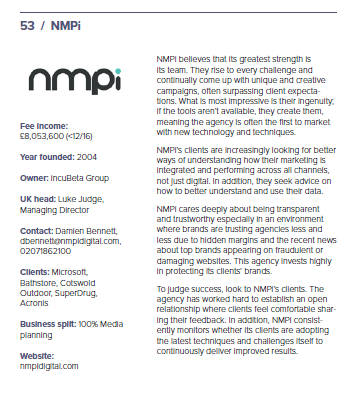 The launch of NMPi US follows a significant client win for us. In September this year, we began delivering Paid Search, Display, Paid Social and Analytics services for US retail group, Fullbeauty Brands, and seven of their subsidiary companies. Fullbeauty Brands has specialized in plus-size clothing for women and men in the US for over 100 years and includes the popular brands Jessica London, ellos, Woman Within, and King Size Direct. “In today’s competitive global environment, retailers need every measure of help they can get in driving top-line growth and running their day-to-day operations,” commented Judge. “Cross-border revenue streams driven by effective digital marketing solutions can help alleviate some of that pressure, but it is often difficult to put the right people and processes in place to get that started. With Pitney Bowes, we will offer retailers scalable, global, digital marketing solutions that meet consumers where they are and guide them to a superior global e-commerce experience. We are thrilled to announce that NMPi has won in the “Innovative Strategy” category at the first IAB Programmatic Awards in The Netherlands. Advertising industry specialists looked forward seeing this year’s groundbreaking entries, and we were excited to be counted among the prestigious nominees for our case study: Real-Time visibility of Snow Heights for Transavia. The IAB Programmatic Awards are important because they are voted on by industry experts in recognition of agencies that deliver outstanding results. NMPi Netherland’s Head of Consultancy, Quintijn van Kessel added: “The IAB Award recognizes our work over the last couple of months in close cooperation with our client, Transavia. It’s great to see this acknowledged with this Innovative Strategy win”. This award comes on the heels of NMPi’s RAR+ (Recommended Agency Register) win for ‘Best Search’. The second half of 2017 is set to be even more exciting, with this award acting as a springboard to further success!